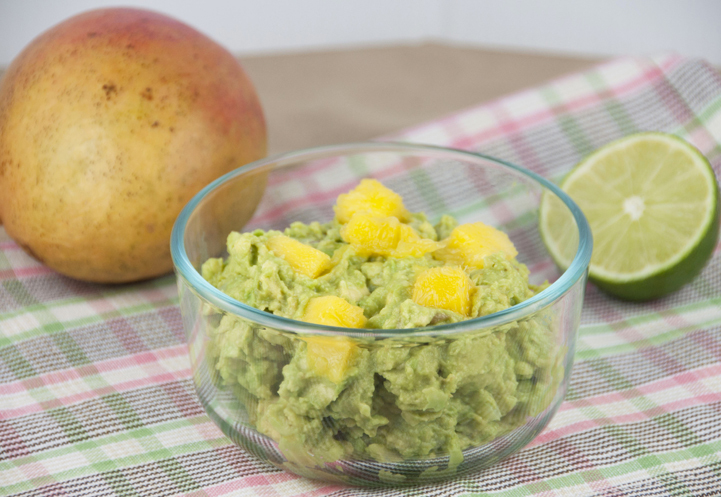 A quick and easy Cinco de Mayo recipe for you and it’s a winner – mango guacamole! This would also be good for summer or St. Patrick’s Day! Today I am on my way to Savannah, Georgia and couldn’t be more excited to see this city that everyone speaks so highly of. We are heading south for one of our good friend’s wedding coming up this weekend and decided to go down a few days early and hit up Savannah while we were in the area. I can’t wait to try out some new places and indulge in authentic southern cooking. I love love love guacamole and I can eat it straight with a spoon…I really don’t even need the chips. It is the perfect accompaniment to many of my favorite foods: burritos, fajitas, quesadillas, nachos, tacos….you name it. For me, there’s really not much that guacamole doesn’t improve and it’s just so insanely addictive with a big bowl of tortilla chips. Good thing guacamole is really easy to make and is also healthy for you! I make traditional guacamole a lot but I was in the produce section at the grocery store a couple nights ago and wanted to add something fun to it this time. A ripe, juicy mango is what I decided to go with. I loved the added color and the sweetness from adding the mango to the guacamole. My wheels are now turning thinking of so many other fruits that would be a delicious add-in, too. Avocado and mango are such a great combination. Who knew?! I think you are really going to enjoy this recipe. 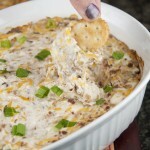 It would be perfect for a summer outdoor BBQ to liven up the standard chip ‘n dip spread. Cut each avocado in half lengthwise. Remove the pit from the avocado and discard. Remove the avocado from the skin with a spoon and place the avocado flesh in a bowl. Using a vegetable peeler, remove the skin of the mango. Using a sharp knife, slice the wide flat part of the fruit off one side of the pit. Repeat this process for the other side of the mango. Transfer the 2 mango slices to a cutting board and cut into 1/2-inch pieces. Add the mango, cilantro, red onion, chile, lime juice, salt, and pepper to the bowl. Mash with a fork until half smooth and half chunky (depending on your preference). Taste and add more salt if desired. Garnish with more diced mango and cilantro sprigs. So jealous your visiting Savannah! Its on my must see list. Avocados pair really well with fruit and this dip sounds super yum. mmm love mango and avocados together! Have you seen the new cookbook, Absolutely Avocados? 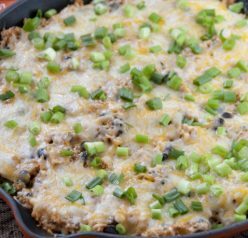 There’s a similar recipe for guac, plus tons of other great ideas! You would love it!! What a sweet and delicious addition to guacamole. 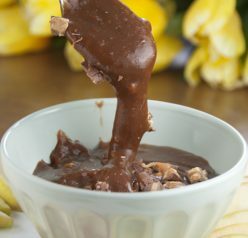 Every time I see the title of your posts, I always think, yep I want that 🙂 This will be perfect for the memorial day spread I’m planning! Great take on guacamole! And mangoes are so in season at the moment, a great way to sue them. Terrific recipe – thanks so much. love the addition of mangoes in this!! such a great idea! Thanks, Anne! It was so good! Never thought of adding mango to guacamole… it sounds terrific! Have fun in Savannah! I never thought of it before recently and it really was good! I LOVE mango guac!!!! Mmmm, now I’m craving a bowl of it somethin’ fierce. haha Ashley! I love it! I love guacamole, but I’ve never added mango into it before — looks an sounds really good! It’s worth a try – so good!